· Eat your meals slowly, chewing each bite numerous times before taking the next. · Keep it simple; do not have too many things on your plate. The more complex the meal the harder the digestive enzymes have to work. · Eliminate drinking fluids while eating. Digestion starts in the mouth, liquids will wash away the critical enzymes needed to start the process. Any other time of the day drink plenty of water. · Eat foods that are easy for you to digest, know your body. Keeping track of the foods you eat and how your body responds to them is an important step when finding the culprit. · Consume smaller portions; too much food at one time is difficult for the body to digest. Warm foods are often much easier on the system, the body does not have to regulate the temperature as much before the digestion begins. · Have an appropriate amount of protein, carbohydrates and fat at each meal. They all work together to provide the body with energy and nutrients, when proportions are off the body does not work as efficiently as possible. · Exercising the body and the mind regularly keeps the muscles toned (inside and out). Movement of energy in the body keeps tension away. Yoga and mediation are excellent options for relieving stress physically and emotionally. · Stress and tension are contributing factors to an unhealthy digestive tract. Our systems all function together and our emotional state has a huge impact on our digestive health. If we choose to satisfy the urge to consume bad foods we are only inviting more stress into our lives and our bodies. Choose your foods wisely and you will see and feel the benefits. Looking at the functions of the body holistically allows us to take charge of our health. Knowing that we can fix most problems with our diet alone is hopefully something we can all come to truly believe. Preventative maintenance (eating healthy), journaling, cooking, and elimination diets are a few things we can do to unravel the problem in the system. Allopathic medicine (conventional medicine) does not always work well, especially with digestive issues. Some have strong side effects and may provide quick relief of symptoms but can cause a weakness or dependence in the system that could later contribute to more serious diseases. Learn to understand your body and it will give you feedback; then all you have to do is listen! I can't seem to make enough to keep up with the demand of this amazing cream! Monthly batches are made since there are no preservatives, chemicals or fragrances. Grapeseed oil, coconut oil, aloe vera, beeswax, vitamin E, lanolin and therapeutic grade Frankincense Essential Oil as well as my LOVE! Frankincense is known as one of the most prized and precious essential oils, it can offer a variety of health benefits internally and externally. As the king of all oils, Frankincense is known to promote cellular health and immunity, even fighting cancer. It serves as an overall tonic to the body's systems by reducing pain and inflammation. It's soothing qualities are used to rejuvenate skin and reduce the appearance of scars, stretch marks and slows the signs of aging by reducing the appearance of skin imperfections. This powerful essential oil can also help by relieving chronic stress and anxiety, by inducing feelings of peace, relaxation and overall wellness. © 2016 dōTERRA. All Rights Reserved. Countless hours of my life have been dedicated to the study of the healing path of yoga. For the past 16 years of integrating the principles of this spiritual path in my body, mind and soul I am forever grateful that I was led to this journey. Most recently, I spent 10 days in the Lucerne Valley Desert with renowned teacher Nischala Joy Devi. She shared her wisdom and knowledge generously, told her stories with humor and lives her life with grace and consciousness, a true teacher! Now it is time to share what I have learned, and as Nischala says "when the flower opens, the bees will come". The Yoga of the Heart Program is a Cardiac and Cancer Certification training that was designed for medical professions and yoga therapists to adapt yoga practices to the special needs of these populations. This training has been led by the director of stress management, Nischala Joy Devi, of the The Dean Ornish Program for Reversing Heart Disease. The first program scientifically proven to “undo” (reverse) heart disease by making comprehensive lifestyle changes. I am sharing this with you because you know someone who has risk factors for heart disease, is living with heart disease or cancer. As a nutritionist, yoga therapist and personal trainer I am confident I can help. I will guide them individually and/or in a group setting through a program based on nutrition, stress management, exercise and support. Please let me know if I can help! Moving forward, we can begin to change the products we use in our home and on our bodies. Using plants to purify is natural medicine and brings balance to all our senses... give the body what it needs from nature and it will thrive! Spring is a time of renewal, letting go of what we don't need and making room for what nourishes our body, mind and spirit. The 30 day cleanse and restore program rejuvenates the whole person by replacing bad habits and poor foods that don’t work well with our individual chemistry. Gradually the toxins will make their way out of the body and the body’s systems can function at their peak. We do this together by introducing a clean diet packed full of nutrients completely supplied by Mother Nature. There is NO starving, strict juicing or depriving but consuming quality real foods and supplements that feel good for you and the planet. Take advantage of the season and feel supported by nature and your fellow cleansers that are also in the program. We start together on the Spring Equinox, March 20th, but you must register by the 15th. The cost of the program is $295 and includes a consultation with a nutritionist and weekley support throughout the cleanse, food guidelines and supplements for 30 days to optimize detoxification. After leading another successful Yoga and Surf Retreat in Costa Rica with some amazing souls, I decided I really wanted and needed to stay a little longer. So we rented a 4-wheel drive car and headed south. We took the ferry across the Nicoya Peninsula, drove over crocodile filled rivers and through small rivers, stopped in a few small towns and followed the western coast along a rugged dirt road to the tip of the Osa Peninsula. Here we found paradise, an untouched pristine region of the country, exactly what I was looking for! According to National Geographic it is the most biologically diverse places on earth. I have been dreaming of this place since my first visit to Costa Rica in the year 2000. We stayed at an eco-lodge that is nestled in the dense jungle and filled with wildlife (our next retreat location :). Our entertainment couldn't have been better. We watched the 4 different types of monkeys swinging from branch to branch, wrestling, howling at all hours and peeking over the roof to check us out. A pair of toucans ate their breakfast in the tree out front, Scarlet Macaws flew by squawking to let us know to glance up to watch the magnificent birds show their colors, and hundreds of other types of birds sang to us all day long! There were tons of lizards, which I particularly love :) a scorpion on my toilet seat, frogs to accompany our walk back from dinner, the ground literally moved! We took a short stroll after dinner through the pitch black jungle to the beach, eyes peeled for glowing eyes staring back at us, a possible jaguar or puma sighting would of just been over the top! I am sure they were among us as we gazed up to a wide open sky FILLED with stars This place is ALIVE, filled with Prana, it felt so nourishing, so peaceful and so natural. Breathing felt like an exchange of energy between me and the plants, the animals, the butterflies and the stars.... harmony! Now this is living, if only we could sustain it without actually moving there (although it's in the back of my mind). I have finally returned back to my life here in Southern California. It is a fantastic, BUSY life that requires a lot of energy, physically, emotionally and mentally. I am sure you can relate, right? How do I keep that feeling of harmony and peace? And if you haven't felt that in awhile how do you get those feelings without having to travel to a remote jungle? 1. Take a mini vacation everyday! Set aside an hour of your day for yourself, doing exactly what feeds your soul.... walk in nature, practice yoga, surf, bike, read, tea with friends, you name it. In order to give to your family, your lover, your kids, your job, without getting depleted.... you MUST feed yourself with nourishing practices so there is an even exchange of energy. 2. Allow time each day to prepare your meals with nature's finest whole foods, eat your meals slowly and be completely present for each bite. Food is what makes up your body, if you are giving it low quality fuel, your gonna get low quality living. 3. Use natural healing methods such as Yoga, meditation, massage and essential oils as your medicine to keep your body, mind and spirit in good health. As a seeker in this life, I have been blessed with the desire, to change to grow to learn. These are MY intentions for the new year, what are yours? We are coming upon a season recognized by medical establishments and pharmaceutical companies, FLU season! The fear of getting sick has increased drastically, thanks to media. (Iv'e got east coast in my blood... sarcasm is in FULL effect today!) This added stress is exactly what we need to avoid in order to keep our immunity up. The anxiety actually weakens the immune system, so in a sense we can bring it on ourselves. The media has drawn attention to the worse cases; the majority of people are not dying or getting severely ill.
8. Order your daily whole foods based vitamin supplement, such as DoTerra's Lifelong Vitality, this will help keep your body in balance and able to fight any invaders. Most of these reminders are niyamas within Patanjali’s Yoga Sutras. Practicing saucha or purity creates cleanliness in the body and mind. This will allow our body to work optimally to fight any invading bacteria. A clean and uncluttered environment will be beneficial as well. When sickness is in the air try to stay home more often to avoid exposure but also give yourself some stress-free quality time. While at home stock up with healthy goodies and make some home cooked meals. The following recipe is easy and healthy. The miso paste is sold in natural food stores. A cup of miso soup provides an abundant amount of valuable minerals, fat and protein (even more if you add organic tofu or chicken ). It also contains healthy bacteria, such as lactobacilli helping to promote healthy digestion. Warm foods are easier on the system, allowing the body to direct its energy where it is needed most. Lightly sauté the vegetables in oil, then add 6 cups of water to the pan. Simmer for 30 minutes. Dissolve the miso in a cup of hot water and add to the pan 5 minutes before the end of the cooking. Do not boil the soup once the miso has been added to avoid killing the healthy bacteria. Feel free to add any seasonal veggies and seaweed for additional nutrients. Share with loved ones and stay positive! What if you could transform your health in 30 days? If you have been stressed out, feeling low energy, or struggling to lose weight this might be just the right time to make a change. Up to 80% of diseases today are directly related to toxicity. Is your body giving you warning signs? Well than listen up! Through this program you will eliminate foods that have caused an imbalance in the body. Most foods these days have been altered by man, making it harder for the body to digest, this leads to inflammation in the body and can cause serious damage. Alisha will guide you as to what foods may be contributing to your specific condition and offer healthier alternatives that are better for you and the environment.Then we will replenish your body with the proper nutrients, doTerra's Cleanse and Restore Kit is included with this program and will provide you will all of your daily vitamin and mineral needs as well as support the body through detoxification. Sign Up by Oct 4th to take advantage of the local deal! Otherwise the sooner the better, and don't even think about waiting until after the holidays!!! Initial consultation with Alisha Welch, Holistic Nutritionist to customize the cleanse for YOU. Everyone will be different so it is important to work with a nutritionist to determine which foods/supplements are appropriate for your UNIQUE body. Together we will set an appropriate start date for the cleanse. In this conversation we will discuss health concerns, goals, daily habits and current dietary intake. Order supplements that enhance the efficacy! Then go shopping for whole organic foods. Alisha will provide the guidelines for the cleanse so will be clear as to what you CAN eat, and don't worry you will have plenty of yummy and healthy options. Now you have everything you need so start making healthy choices on a daily basis, stick to the program for 30 days and I guarantee you will feel AMAZING!!! I will be here to support you as I am doing it too so your NOT alone. Please don't wait to better your life, I am here to support you on this journey. Blend all 3 ingredients until smooth and no green is showing (so you can trick your friends/kids). At least once a year I find myself craving a detox, a chance to feel my best again! After a summer full offun including BBQ's, camping, birthday parties, concerts, travel, weddings etc. it's time to RESET! I will be starting this cleanse on Wednesday, the Fall Equinox, this is a perfect time to make some positive changes and get in sync with nature. Join me and sign up by Wednesday the 23rd and I'll throw in a bottle of doTERRA Lavender or Peppermint essential oil! This is an amazing introductory offer, don't miss out! (Value $574=Consult $125, Supplements $225, Cleanse Program $99, Farm to Table 5 course meal $100, and week of CSA share $20). Follow my blog for recipes, helpful tips and ways to stay on track on! AMAZING Kale Smoothie Recipe with a drop of Cinnamon- YUM! Not only does the smoothie taste great, the Cinnamon promotes circulation, which helps to alleviate aches and pains naturally. 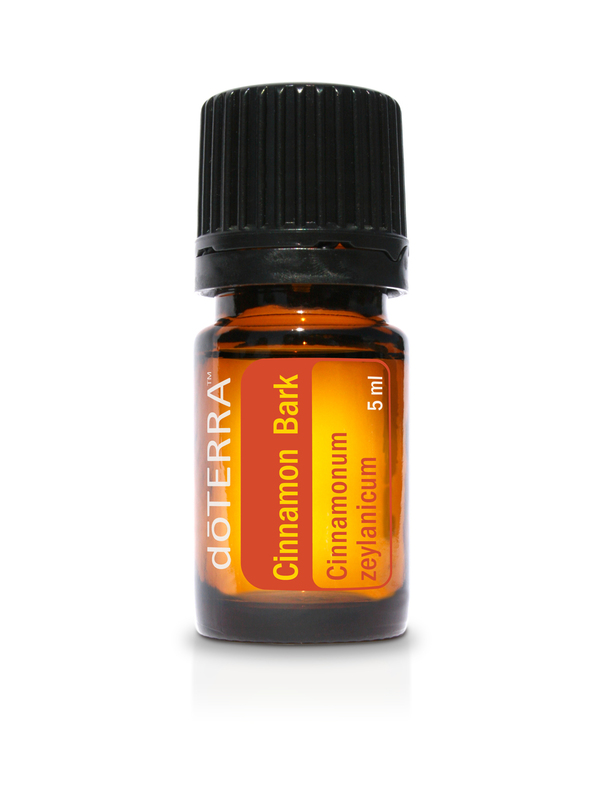 The oil from the Cinnamon bark also has therapeutic properties that builds and maintains a healthy immune system. Kale is a powerhouse of nutrients, it has anti-inflammatory properties (vitamin K) and high doses of antioxidants (vitamins A & C) both of which help to prevent and combat against cancer, and help inflammatory conditions such as arthritis, autoimmune disorders and asthma. Rid your home of harsh chemicals found in most commercial cleaners and create a healthy living environment for you and your family. DoTERRA Certified Pure Therapeutic Grade Essential oils naturally kill various types of bacteria, mold, spores and even viruses. Even if they are only used as a natural deodorizer they can provide an amazing scent without any artificial fragrances. These recipes for DIY cleaners are both cost-effective and safe to use in homes with children and pets. Try these 5 easy recipes for natural cleaning products that are good for your home, your body and the planet- just as nature intended! 1. All-purpose cleaner: An all-purpose cleaner is just that—something you can use for just about every surface in your home, from kitchen counters and appliances to bathrooms. Using a spray bottle, combine 2 cups of white vinegar, 1 cup water and 15 drops of a disinfecting essential oil: On Guard, lemon, Purify, melaleuca, lime, cinnamon thyme or peppermint. The spray will keep indefinitely and provide healing properties for you as well. 2. Mildew spray: It's hard to keep things clean living by the sea, but with regular maintenance this spray will keep your bathroom mildew free and is good for your lungs! Mix 5 drops of lemon and 5 drops of white fir with 2 oz. of water in a small spray bottle..
3.Carpet cleaner: To clean and disinfect your carpet, mix 1 cup baking soda and 20-50 drops melaleuca, lemon, Purify or any other favorite oil in a glass jar. Close it, shake it, and let it sit overnight. Sprinkle over the carpet and let sit for 15 minutes and then vacuum. 4. Toilet cleaner: No need to pollute our ocean with those toxic toilet bowl cleaners, use this natural solution instead. Sprinkle baking soda or pour white vinegar into the toilet, and a couple drops of lemon or grapefruit essential oil and let sit for a few minutes. Scrub with a good toilet brush. 5. Air freshener: Ever wonder about the toxicity of synthetic air fresheners, well maybe not but I do. The ingredients used have been found to be linked to a number of health problems from headaches to cancer, here is an easy fix....Place 5-8 drops of a deodorizing oil: Purify, peppermint, clary sage, melaleuca, lavender, geranium and eucalyptus in a 1 oz. spray bottle and fill the remainder of the bottle with water. Shake well and spray into the air. If you would like these amazing oils diffusing in your home all day or night, I highly recommend purchasing a quality diffuser, your home will smell incredible! *Since some oils can clog spray bottles, it may help to dissolve the essential oil in 1 tsp. of grain alcohol before adding water to the spray bottle. 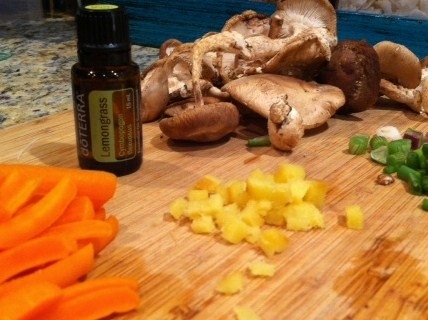 I have been exploring more and more ways to use therapeutic grade essential oils in my everyday life and came up with this yummy soup. But wait, don't go run out to the store, not just any essential oil will do. Many oils are being processed at high temperature and high pressure, which may keep their aromatic properties but will diminish their healing properties. Pure, therapeutic grade essential oils such as doTERRA essential oils are safe and natural and are a great way to enhance your meals. They are more concentrated and can be used year round if fresh herbs and spices are not available or replacing dried herbs or powdered spices that have lost many of the essential oils that are found in the natural plant. A little goes a long way, you won't need very much. I recommend to start with a drop or two and check the flavor before you add more. It is best to add the essential oils when the food has cooled down a bit, so the volatile oils are not affected by the heat. If you need to add the oil sooner then you may add a bit more to account for any oil that may be evaporated during the cooking process. It is a tall, perennial plant, Lemongrass has a subtle citrus flavor and is used in Asian cuisine in soups, teas, and curries as well as with fish, poultry, beef, and seafood. In addition to its unique flavor, Lemongrass essential oil promotes healthy digestion and acts as an overall tonic to the body’s systems. It’s also purifying and toning to the skin, and is frequently used in skin care products for these benefits. Lemongrass can soothe sore muscles and joints, making it an ideal oil to use in massage therapy or applied directly to problem areas. Lemongrass has a pungent, herbaceous aroma that can heighten awareness and promote a positive outlook. Would you like more information on essential oils? I'd be happy to chat. Contact me with your email and phone number and we can set up a free consultation. Browse or shop NOW for doTERRA Essential oils and start using them in your home and experience the healing for yourself! As we all know it is extremely important to be mindful about what we are eating, but how many times do we consider how we are eating? How we consume our food effects the quality of our digestive system, which directly relates to our overall state of health. The majority of diseases originate in the colon, therefore, numerous health conditions are linked to inefficient digestion, some of which are deadly. · Eating in a calm and quiet setting will create a peaceful meal. Throughout the day we are exposed to distractions that stimulate the mind. At meal time we should be free of these distractions and focus on the meal. Eliminating music, books, television and conversation will help to keep our focus on the beautiful gifts we are about to receive on our plate, allowing us to be more aware of the tastes, smells, and textures of our food. · Allow plenty of time to eat your meals and chew food well. Chewing thoroughly will start the digestion process in the mouth by releasing enzymes and will also allow the food to be absorbed properly by the body. · Prepare your plate with appropriate serving size and stick to it; it takes some time before your stomach tells the brain that it is full. So don’t head over for seconds until you have given the body at least a 15 minute break, then re-evaluate. · Create a routine and eat at the same time everyday, this way the body can function with a routine as well. Variety of food choices will keep eating pleasurable and satisfying and will also eliminate cravings and deficiencies. · Do not eat when you are emotionally imbalanced. Most likely you will consume foods that are deficient in nutrients or overeat. This will create cravings and lead to feelings of guilt or stress. · Minimize the amount of water you drink during the meal. Water during meal time decreases the digestive fire and dilutes some of the key digestive enzymes needed for proper assimilation. Last but not least, give thanks! All the time and energy expended for one meal deserves a prayer of gratitude to all who made this possible. The warmth from the sun, the energy from mother earth, the hard work from the farmers, and every life that made it possible for these gifts to be a part of our meal should be recognized with each bite. Well that was sure nice of them to finally let us know that they have been putting toxic chemicals in our personal care products for years and will probably continue to do so! TAKE ACTION by making your own, it's super easy, fun and less expensive than most products. I found this recipe when I was studying Herbs in my Holistic Nutrition course from one of my textbooks; Rosemary Gladstar's Herbal Recipes for Vibrant Health. I have made it for years and have given it away as gifts and everyone LOVES it! I have to admit I used to use store bought essential oils and have done my research and found most store bought essential oils actually only have 5-10% of the actual oil, the rest is filled with synthetics and fillers. SO from now I on I will only use doTerra Certified Pure Therapeutic Grade Essential Oils for all my DIY projects. Follow this recipe closely as making oil and water mix together isn't always super easy. Give it a few tries to determine exactly how to do it to get the consistency that you will enjoy daily. Store them in recycled facial cream jars and even better if it's glass. 1. Combine the waters in a glass measuring cup and set aside. 2. In a double boiler over low heat, combine oils (except essential oil) heat them just enough to melt. Turn off heat and add essential oil. 3. Pour the oils in a blender and let them cool to room temperature. THe mixture should become thick, creamy and semisolid, you might need to put it in the fridge for awhile to help the cooling process. Make sure it doesn't get too hard. 4. When the mixture has cooled, turn on the blender at it's highest speed and slowly pour the waters into the center. 5. When most or all of the water has been added to the oils, listen for a choking sound of the blender and look for a thick frosting-like cream. Turn off the blender, the cream will thicken as it sets. 6. Pour into jars and store in a cool place. Most of these products can be purchased at your local health food store, except the Essential oils. You can visit doTerra and purchase your essential oil here, as well as learn more about the healing properties of each oil to customize your cream. Nourish your body and mind with a detoxifying and relaxing bath tonight! Mix 2 Cups Epsom Salts and 10 drops Lavender Essential Oil in a hot bath. Light a candle, make yourself some herbal tea and enjoy, you deserve it! Not only is it super easy but it's healthier and can be cheaper! WIN WIN and WIN! 1. Start with a cup of raw whole almonds and soak overnight in purified water. 2. Rinse in the morning and blend with 4 cups purified water. If you like it a little sweeter, toss in 2 dates while blending (remove seeds). 3. Strain through mesh sieve and store milk in refrigerator and reserve almond meal. 4. Bake almond meal in lightly greased pan for about 45 minutes at 200 degrees. This homemade recipe is made without all the other fillers, but needs to be consumed within a week since it doesn't have preservatives to make it last longer. See ingredients below to note the synthetic ingredients that are in store bought almond milk products. In today’s modern society we are challenged by the thought that giving has to be in the form of something tangible, especially around the holidays. To better understand this Universal law, we must think of giving and receiving as simply an exchange of energy. When we give without the expectation of receiving we allow the energy of the universe to flow naturally. Similar to the exchange of the tides, as one gives the other receives and this balanced state creates harmony. The attitude of "getting" limits the flow of good that wants to come to us. If we simply give to get, we cause the flow to stop. When we are truly giving, we are not seeking any reward or payback. When we give from the heart and with no expectations, we open ourselves up to the abundance of good energy in all forms. Many of us are willing to rid our cabinets of body care products with harsh ingredients. However, when it comes to deodorant we somehow negotiate in fear of having body odor. This is not enough reason to disregard concerns around the ingredients found in conventional deodorants and antiperspirants. Especially when we are applying this product under our arms, near lymph nodes that function to collect waste from the bloodstream and are essential for the proper functioning of the immune system. Many deodorant products are effective at blocking the sweat, (which is how the body eliminates toxins) and are filled with other ingredients that are worth avoiding or at least looking into. Replacing these products with safer alternatives is not only easy but once the body adjusts they are effective as well. Aluminum is the active ingredient in antiperspirants which prevents us from sweating. Parabens are synthetic preservatives found in most cosmetics and personal care products. Both of which are estrogenic compounds. These compounds mimic women's hormones and disrupt women's endocrine system. This system regulates major functions of the body, and the disruption of this system inhibits the body’s ability to communicate with itself. Some endocrine disruptors, such as parabens and aluminum, have been linked to breast cancer. Aluminum is also known as a nuerotoxin and has been linked to nuerological disorders such as Alzhemier's disease. Although studies about these health risks are not conclusive, its safe to say that seeking natural options is always a better choice. Many companies are developing safer alternatives, which work to kill odor causing bacteria and neutralize the smell of sweat rather than trying to stop it all together. The Crystal Deodorant stone is safe, inexpensive and effective deodorant option. There are plenty of other great products on the market, seek deodorants with natural antibacterial ingredients such as tea tree oil, witch hazel, baking soda, hops, sage or lemon peel. DIY deodorant recipes are always an option as well. With all of the beauty surrounding me, and a blind eye to the news, it's difficult to sometimes realize that there are struggles going on with Mother Nature. The past three years have been abnormally dry and now 58% of the state of California is in exceptional drought. This is the most extreme category, which indicates widespread crop and pasture losses and shortages of water in reservoirs, streams and wells. "Here in San Diego County, we import 80 percent of our water from outside the region. So being water importers, we have the responsibility to use that water as efficiently as possible," Travis Pritchard of San Diego Coastkeeper said. Since I've been swimming in the ocean, I have been using a lot less water for showering, making me feel a little better. There are many other things that we can do to help conserve this precious resource. I have given you some very easy suggestions to step up your game as a conscious consumer on this beautiful planet we call home. 1. Washing dishes: if using a dishwasher, make sure its FULL, if doing by hand turn off the water between dishes. 2. Washing clothes: wait until you have a full load and wash with cold water.